Choosing the small wastewater treatment plant (SWTP), the client takes into consideration the price, the warranty period, the service costs, the consumption of electricity and so on, but even if one wants to simplify and to cheapen the solving of sewage treatment problem, one should understand that the quality and the stability of the necessary parameters of the cleared sewage are of the greatest importance, and primitive SWTP simply cannot provide it. The European countries have been working on SWTP for a long time already, but the norms of quality for clearing of small volumes of sewage are very low (the biochemical oxygen consumption is 30 – 60 mg/l, the weight is 30 – 60 mg/l, nitrogen and phosphorous are not normed at all as a rule), so there was no reason for developers in Europe to work at effective small clearing constructions with such low requirements to cleared sewage. As far as the city sewage treatment plants are concerned, one could learn much from western developers, as the requirements of the cleared sewage get higher and more serious with the growth of a sewage treatment plant (WTP) capacity. The small clearing constructions were also developed on the pattern of city WTP, only scaled, but this approach is not acceptable. As a result of the above-stated reasons there was a certain vacuum in the field of small clearing constructions which gave a push to creation of new technology of biological sewage treatment – BIOTAL. What are the main problems of treatment of small volumes of sewage? – Fresh concentrated sewage goes into the small clearing constructions, and the quantity of organic substances, nitrogen and phosphorus in such sewage sometimes exceeds the normal for biological process correlation – 100:5:1 (organic : nitrogen : phosphorus), that is why in primitive unautomated systems these pollutants, that exceed the correlation, will flow away from the station together with the cleared sewage. – Volley inflow of sewage can bring to the plant over 20% of day inflow in a few minutes. The plant should be able to accept the volley inflow without the outflow of sludge with the cleared wastewater. – Long absence of sewage inflow, for instance in the vacation period, is also a problem. If there will be no automatic power regulation, the self-oxidation (the dying off) of the active sludge will take place. – Pollutants, that are toxic for active sludge microorganisms may appear in the sewage. For example the inflow of a great quantity of detergents during the laundry. – Sewage with high concentration of basic pollutants can inflow into the plant, for example the sewage from kitchen. In this case the BOC of the sewage may reach up to 2000 mg/l, and it is known that for BOC more than 500 mg/l one must foresee at least double-sludge system with multiplanimetric recirculation of returnable active sludge. – Growing of active sludge quantity during the process of treatment. If it is not removed automatically, it will flow away with the cleared sewage after reaching the critical concentration. already cleared by 20% in the sewerage network, and it is also diluted with the clean waters, mixed with industrial sewage, that usually has a shortage of phosphorous. As a result this sewage comes to treatment plants as a “cocktail”, perfect for microorganisms. Small sewage treatment systems do not meet the inflowing wastewater like that. Experts in the field of sewage treatment know that small clearing constructions should be designed at higher technological level than big ones because it should provide required quality of sewage treatment in extreme conditions without the constant attendants and with the minimal expenses for their exploitation (electrical and thermal energy, etc.). For example the small clearing constructions treating sewage from a cottage should be solved at higher technological level than the big clearing constructions of city of Paris. A favorite phrase of some designers of small clearing constructions «…we use the operational experience of the big clearing constructions during the development of our technology of small constructions…» is absurd as the listed difficult conditions of sewage treatment on small clearing constructions, make unacceptable their designing by analogy of big constructions especially by the way of their geometrical reduction. Let us review some technological aspects of the biological sewage treatment, that one needs to know to understand the processes that take place in SWTP. The plant of biological sewage treatment represents «an alive organism», consisting of millions “workers – bacteria” eating pollutants and clearing sewage. 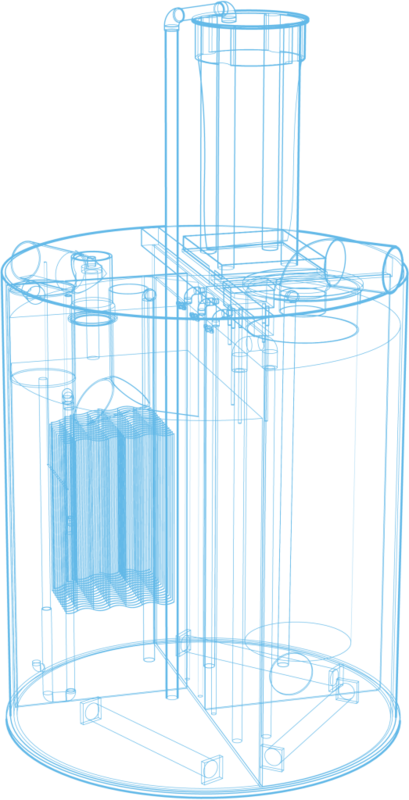 There are two ways of sewage processing – a continuous one, when the sewage is processed moving from one zone of plant to another, and a discontinuous one (an SBR-reactor), when all the cycles of purifying take place in one container, only conditions – aerating, mixing, sedimentation, surplus sludge removal – follow one another. Both ways have their own advantages and disadvantages. Continuous way of sewage treatment doesn’t permit to support constant active sludge concentration in the plant within 5 – 6 g/l, which is necessary for oxidation of the increased quantity of fats and detergents, which came with the sewage into the plant, because during the volley sewage inflow it can be taken away with the ascending waterflow in the sedimentation tank. A serious disadvantage of the continuous way of sewage clearing is also the sedimentation and rotting of the active sludge in the secondary sedimentation container. There is no rhythmic interchange of oxidation and restoration processes. In the period of minimal or maximum inflow the time of sewage processing is not correct. Sticking of sludge on the walls of the secondary sedimentation tank and its coming to the surface as a result of unallowed denitrification with the outflow together with the cleared sewage is also a problem of such systems. A serious problem for such systems is also the necessity of removal of the surfacial pollutants (fats, particles of active sludge and so on) from the sedimentary tanks. Discontinuous way of sewage treatment (SBR-reactor) hasn’t got the listed problems, but it has its own disadvantages. The active sludge, adapted to certain conditions of the sewage requires a significant period of time for adaptation to new wastewater portion, the rate of purification in this period is low. After it is partly adapted to new conditions, another cycle starts and the problems repeat. One of the main laws of engineering chemistry is not kept here – the process should last as long as it is possible. The SBR-reactors are made for 4-hour purification cycle, and only light organic pollutants are oxydized during it, the water purification is insufficient. The nitrification process takes place only when almost all the organic substances are oxydized, so reaching denitrification (the necessary conditions of which are complete nitrification and the availability of light organic substances) is impossible in SBR-system, because it is closed and the light organic is already oxydized. However this system has also got a number of advantages. It allows to support the high concentration of the active sludge in the system without the risk that it will outflow with the cleared water, because the sedimentation in SBR-systems takes place without any water movement. The next important advantage is that there is no necessity of removing the surfacial pollutants, because the cleared sewage is pumped from the clarified layer of water, under the level of water in the container. This way of sewage processing allows to avoid building of the secondary sedimentation container, as the airtank can be a sedimentation tank itself when the aeration is off. Therefore, because of the complication of sewage treatment of small volumes, the SWTP should have advantages of both ways of sewage processing, and it should have no their disadvantages. What the reverse recirculation of active sludge is needed for? It is one of the main conditions for a good work of sewage treatment system. In the beginning of the system the sludge absorbs organic pollutants, and then it oxydizes them moving from one clearing zone to another, and gets regenerated and hungry, having eaten all the absorbed pollutants. The returnable active sludge, being hungry, gets into the receiving chamber and more effectively removes the pollution from fresh sewage. If one doesn’t bring the returnable active sludge back to the beginning of the plant, the sludge in the end of the system will mineralize itself (simply die, because there are no organic substances for its nutrition), and at the beginning of the system the sludge will be overloaded and will not work effectively. The denitrification – the process of nitrogen removal – will not take place if there is no recirculation of returnable active sludge, because denitrification requires the availability of light organic substances. The gaseous nitrogen after denitrification goes back to atmosphere. As the ammonia nitrogen is oxydized to nitrites and nitrates only after the most of organic substances are removed from the sewage (it is the peculiarity of the biological process), that is to say in the last and in the next to last reactors, the only chance to make fresh organics and nitrates meet is to provide the recirculation of returnable active sludge. It is not the complete list of the advantages of recirculation, the dissolving of toxic pollutants also takes place thanks to it. During the extended aeration with cyclic processes of aeration and mixing combined with the more than 25 days age of active sludge, the facultative microorganisms appear, which take an active part in the purification processes both in aerobic and unoxyde conditions. Thanks to it, the quantity of aerobic active sludge in the system increases, the nitrification and denitrification bacteria appear – as a result the nitrogen and partly phosphorous are removed from the sewage in biological way. During the extended aeration the active sludge grows in quantity 0,25 – 0,35 mg of BOC taken, and during the sewage treatment on the city plants it grows up to 0,8 mg. The surplus active sludge should be removed from the system regularly. Some constructors’ statement that the surplus active sludge practically is not formed in their systems and that it can be removed twice a year is absurd, and it is almost the same as the statement that someone has three meals a day, but uses a toilet twice a year. A man is also like a bacteria, only a huge one, the biological processes during the digestion are like the processes that take place during the oxydation of the pollutants by the bacteria of active sludge. However the “surplus active sludge” of the human being is a “food” for the microorganisms of the active sludge in the plant. In other words, the bacteria of active sludge oxydize what a man hasn’t. As it was said above, concentration of active sludge in the system should be within the limits of 5-6 g/l for effective sewage treatment. At the greater concentration of active sludge there will be a secondary pollution of cleared sewage, and at smaller concentration of active sludge the system will not cope with clearing volley (organic) inflows of sewage. No city sewage treatment plant is capable to cope with such concentration of detergent, fats and disinfectant solutions which inflow with sewage on small clearing constructions (for example from a cottage, during the laundry, preparation of meals or washing sanitary engineering devices and floors). Dewatering of surplus sludge is made for decreasing of the volume of a main product of sewage treatment, for cheapening and simplifying of operations with it and its transportation to the utilization place. Variety of devices exists for the surplus active sludge dewatering, but most of them are expensive and require the use of floculants, the process is accompanied by an unpleasant smell and the personnel for it is also needed. But one can choose another way for the plants up to 1000 cubic meters per day. Since the active sludge is of a significant age, and thanks to extended aeration (for more than 25 days), and therefore thanks to the high mineralization of the active sludge, its stabilization in the aerobic stabilization tank is sufficient. After that its mineralization is almost complete, and its dewatering can take place in the sludge bags without adding of any floculants. All the process of dewatering in this case is not very complicated and can be easily automatized. As it was mentioned before, during the extended aeration the active sludge grows in quantity 0,25 – 0,35 mg of BOC taken, if by some reasons the active sludge in the plant gets “sick”, becomes oppressed, the bacteria practically stops oxydating the pollutants and start to sorb them, the active sludge volume grows significantly, which leads to the infringement of the purification process. There can be a number of reasons for that – the inflow of more sewage and organic pollutants than it was predicted by the project of a plant (the active sludge does not cope with the pollutants); the inflow of fats and detergents in the quantities that exceed the allowed concentration (in this case the flakes of sludge are covered with a thin layer of these pollutants, that prevent oxygen from getting inside such flake); the inflow of the sewage that contains toxic substances in quantities is higher than it is allowed for accepting it into the sewerage systems, the sewage temperature is less than 5 degrees, the pH is out of limits 6,5 – 8,5 and so on. One shouldn’t also arrange any collecting tanks without aeration, because an anaerobic process with hydrogen sulphide exude will take place there, and it will depress the active sludge bacteria in the plant. The local STP can only process the sewage parameters of which allow its accepting into the city sewage treatment plants, in other case one should also foresee the precleaning. One of the basic polluting elements in sewage is nitrogen and phosphorous, and creating the conditions for their simultaneous removal from the sewage is necessary. One should provide the alternation of aerobic and anaerobic conditions in the zones of the plant together with more than 25 days age of active sludge for that. It is necessary to foresee the two-stage nitrification and denitrification, as these processes are very complicated, and the concentrations of the ammonia nitrogen, nitrites and nitrates and light organic substances are changed abruptly all the time. For example, if there is a significant quantity of ammonia nitrogen, it will be oxydized to nitrites and nitrates; but of there are no light organic substances the denitrification won’t pass and the necessary parameters of nitrogen won’t be provided at the outflow. And when the plant has got a few zones of purification with multiplanimetric recirculation of the active sludge, the nitrification will pass, as it starts after main part of organic substances if oxydized, which can’t happen in one aerotank, and nitrites and nitrates will meet the light organic substances sooner or later in the conditions of oxygen lack for denitrification. Phosphorous removal passes mainly because of the surplus active sludge removal, where it is absorbed by PP-bacteria. The common active sludge contains 1,5 – 2% of phosphorous, and the sludge, that is exposed to alternation of aerobic and unoxyde conditions, contains up to 6 – 8% of it. The surplus active sludge should be removed automatically from the aerobic zone, because the phosphorous, accumulated by the PP-bacteria in it dissolves after getting into unoxyde conditions. Under the statement of reliability of SWTP one understand the stability of the biological processes of the ongoing treatment, which is a prerequisite for the stability of the TP, which provides the required high rates of treated wastewater. What basic requirements should be met by a small wastewater treatment plant (capacity from 1.5 to 1000 m3/day) to provide high-quality sewage treatment, without permanent staff, in the context of rising energy prices? 3. The presence of a grid self-cleaning system for the detention of rough impurities in a RC. 4. To ensure the reception of volley discharges of sewage without removal of sludge from the plant with treated sewage. 5. Biological treatment system of the SWTP must be a minimum five-stage, with a three-circuit backflow of recirculated active sludge. 6. Technology should have a minimum double-sludge system. 7. Hydraulic system of the SWTP must provide equalization of volley revenues of sewage and multi-contour reverse circulation with intensity, proportional to the amount of wastewater entering. 12. Automatically switch to the economic modes of work when changing the amount of wastewater entering to the purification, in order to save electricity, the life of the electrical equipment and the alignment of biological process in the long absence of wastewater. Switch to forerid modes when receiving wastewater in excess of the estimated amount. 14. Output to the monitor of the controller the main parameters of the operation of the plant with the possibility of adjusting them in the reactors: the time of aeration, mixing, settling, pumping of treated wastewater, preferably via a modem connection. 15. Have an alarm for a violation of plant operation in the initial phase in order to take action before an emergency occurs. 16. Possibility of repair or replacement of any unit, without stopping the work of the treatment plant. – to ensure the unification of several biological processes within one building. As the clients have often been led astray with the untruthful information, they don’t believe anyone at the moment and become professionals in need, studying the constructions of the SWTP and the principles of sewage treatment. The purpose of this article is to provide everyone who needs it with the information about SWTP, and let the clients make a choice themselves. As a rule, a “great secret” is made of technologies by the companies that produce primitive STP. They understand, that if they describe in details the way their plants work, everyone will see that they do not work at all and that they can’t provide the necessary parameters of cleared sewage. The first group contains the systems, that meet main requirements put to the SWTP – they work in the mode of extended aeration, the control over the process is made with the help of the controller and the process itself is divided into fazes (which is a perfect decision for small STP), have accumulating volumes to accept the volley inflow of the sewage, the system of automatic surplus sludge removal, having the alarm system and so on. Today, only BIOTAL plants with double-sludge seven-stage cleaning can be attributed to such small wastewater treatment plants. The second group of SWTP include systems in which only a part of the above-mentioned technological tasks are solved. The third group of SWTP include systems in which the basic technological problems, which are necessary for qualitative clearing of small volumes of sewage, are not solved. This group also includes SWTP, in which the anaerobic and aerobic purification zones are combined, as the flow of sewage from the anaerobic zone to the aerobic and vice versa, anaerobic and aerobic bacteria are in a depressed state, since they are not able to coexist in unconventional conditions, and it takes 5-7 days for their adaptation. Therefore, systems built on this principle are not effective. SWTP of the second and third groups, as a rule, have the same level of treated waste, that is, hydraulically connected, in operation in all treatment zones, which leads to the release of active sludge from the sediment tank during volley flow to the sewage plant. The required speed of ascending flow, for effective defending in the secondary sedimentation tank, must be measured in millimeters per second. And in such plants, for example, in the case of volleys in the amount of 0,2 m3 (emptying the bath), at a plant with a capacity of 1,5 m3/day, the rate of ascending flow in the secondary sedimentation tank will be within 10 mm/s, which will lead to removal of active sludge from the plant with the subsequent failure of the drainage system. It is the unauthorized removal of surplus active sludge from the plant with purified sewage which is in such systems to solve the issue of “removal of surplus active sludge”. After this, of course, it can be argued ignoring the well-known laws of nature that surplus active sludge in such plants is not formed, or that it is sufficiently removed once a year. The nature is smarter than us, and if it were possible, then the God would have created the man without having to engage in a completely unpleasant business – going to the toilet. Such plants work without automation, as they say “to the full”, regardless of whether the sewage is supplied to the plant or not, which leads to the problems described above. When changing the amount of wastewater entering such plants is violated, as noted above, the estimated time of treatment of sewage in certain areas of the plant. The worst thing is that when the amount of sewage entering the plant increases, the time for treatment of sewage does not increase, as it is necessary to provide the necessary cleaning, but decreases. These are one of the many problems of such “cheap, simple and reliable” wastewater treatment systems. To this you can add that such plants are not much cheaper than the plants belonging to the first group, and if you add a waste of electricity in the absence of revenues for the plant of waste water and clog your drainage, then this cheapness will be “golden”.